What Are the Causes of Eye Puffiness & Swollen Fingers? Lindsay Tadlock began writing in 2010. She has worked as a personal trainer for over three years and shares her fitness and nutrition knowledge in her writings. She graduated from Texas A&M University in 2000 with her Bachelor of Arts in finance and worked for seven years as a commercial lender. Eye puffiness and swollen fingers are most likely not life-threatening problem but can cause discomfort or make you feel insecure about your appearance. There are a number of causes to both, some of which you can correct yourself and others that might require a doctor to prescribe medication. Both eye puffiness and swollen fingers may be caused by an excessive amount of salt in your diet. As you age, the tissue around your eyes and muscles supporting your eyelids weaken. Normal fat supporting the eyes may move forward into the lower lids, causing the eyes to appear puffy. 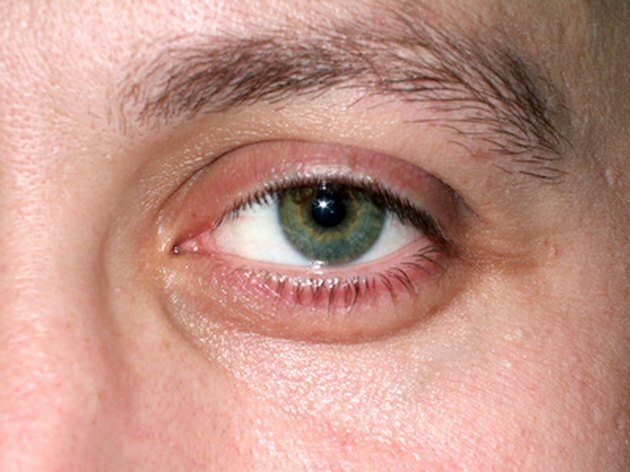 Fluid may accumulate into the space below your eyes, making them appear swollen. Eye puffiness is rarely a sign of a serious medical condition; it may be caused by fluid retention because of changes in weather, hormone levels or eating salty foods, or by not getting enough sleep or sleeping flat on your back. Eye puffiness can also be a result of allergies or be hereditary. Fixes can include skin treatments such as laser resurfacing or chemical peels. You can also opt for eyelid surgery to remove the excess fat and sagging skin. Swollen fingers may be a sign of edema, a swelling caused by fluid trapped in your body's tissues. It is most commonly noticed in your fingers, arms, feet, ankles and legs. Swollen fingers are caused by the leaking of fluid in tiny blood vessels. This leak may be the result of increased pressure in the capillaries or a lowered level of protein in your blood. When your body senses this leakage, your kidneys begin to retain sodium and more water to compensate for the leak. This type of swelling in the fingers may be the result of sitting in one position for too long, eating salty food or pregnancy. Although it is uncommon, swollen fingers may also be caused by congestive heart failure, cirrhosis, kidney disease or damage. Edema may be treated by limiting your salt intake or taking medication to increase your kidneys' output of water and sodium. Swollen fingers may also be a result of scleroderma, a disease that involves hardening and tightening of the skin and tissues. Scleroderma results from an overproduction and accumulation of collagen and occurs at least four times more often in women than it does in men. This disease may be a result of exposure to silica dust, paint thinners or certain chemotherapy drugs. Swollen fingers from scleroderma may resolve itself on its own or you may need medication to control it or prevent complications.